Family Motto: There is nothing that can’t be worked out over a cup of tea. Your image is familiarly comforting, Carin. The chocolate is a bonus. If you don’t mind I think I’ll steal your family’s motto. It’s so true. Something very calming and civilized about tea. We have a special blend we brew in a clay pot and drink out of tiny Chinese cups. It’s a bit of a ceremony, the whole process, no talking allowed. This comes from something I read somewhere. It’s an amazing thing to sit at a table and drink tea with someone in silence. A kind of alchemy happens. And yes. Chocolate is always a bonus. What do I like best? The pretty mug, the chocolate, or the reflections in the teapot? It’s all so inviting! I love that you mention the reflection(s) in the teapot. My favourite part. You’ve given me an idea! Time to put the kettle on! And a plate of something tasty to go with it. Good for a winter day, I thought. Oh, it’s chocolate! I thought it was a pottery shard or something and was trying to work out the significance. I do understand the significance of chocolate, however. A lovely composition and very inviting! What kind of tea is it? With any of my pictures, Elizabeth… when in doubt, assume it’s chocolate! As for the tea, it’s called Pear Cream. A blend of green and white, with apple cubes, orange peel, fennel seed and calendula petals. No pears. I buy it from a shop in Stratford, Ont. That tea sounds so delicious! So inviting and just what’s needed on a day like today. Thanks for the gentle reminder. The pattern of the cup and the reflection stand out so much more in black and white, Carin. My second thought is: what a shiny teapot (must polish mine). I like the other touches too: the eye drifts to the textured tablecloth and the chunk of chocolate. Part of a series — this one and last week’s? Oh you smart photo friends! Yes, the B&W worked much better than colour. Also makes the teapot look shinier! Perfect combo, tea and chocolate. 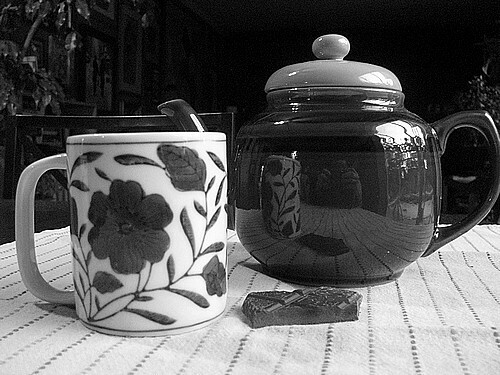 Love how the B&W choice, creates a reflection in the tea pot and emphasizes the pattern in the mug! Love your eye, Cheryl. I dithered about colour or B&W and found the latter just highlighted everything that much more. This has such a beautiful, delicate look — because of the objects themselves, but also the way they are arranged, and the reflection just shining away on the teapot. Lovely!